Do you also have too loose charger port? When I put cable connector it fits very gently and even little cable move disconnects/connects charger. It is very poor fitted. Could anybody help me to resolve charger pinout? If it is following the US standard color coding the Red would be + and the black would be -. If you have a volt meter it would be easy to confirm them. I teared off usb connector so I have naked cables from usb side. Multimeter is useless. In fact red is VCC and black is GND. I have charging enabled, so do you think white would be DATA- and green DATA+? They would not necessarily have to be DATA (+) and (-). 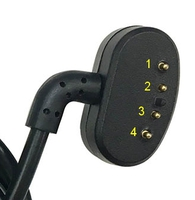 You have a GND (black) and it would not be necessary to run another GND wire to the watch, you would normally just tap off the one GND as GND is usually common to all circuits. You would need to see a wiring diagram to know for sure.